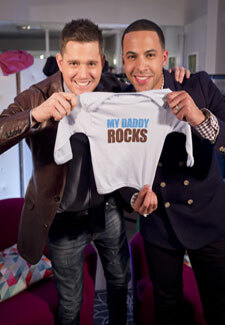 Marvin and Michael talk babies! They are two of the most lusted after men in showbiz, but Michael Buble and JLS singer Marvin Humes only had one thing on their minds when they met yesterday… babies! The dads-to-be sat down for an exclusive chat on Daybreak, and promptly started discussing names for their unborn babes. Marvin revealed to Michael that he and wife Rochelle were thinking of a geographical moniker for their new-born. ‘I wanted to go for some crazy names like London,’ he said. Michael then revealed that he was at loggerheads with his model wife Luisana over what to call their unborn son.